Dr. Prasad Adusumilli at Memorial Sloan Kettering Cancer Center believes novel CAR T-cell therapy will be part of future, standard-of-care treatment for malignant pleural mesothelioma. The therapy involves the laboratory reprograming of a patient’s T cells — a type of white blood cell — to attack the cancer by targeting mesothelin, a surface protein. CAR T-cell therapy is a form of immunotherapy that could extend mesothelioma survival significantly. Adusumilli, a thoracic surgeon and scientist, is the primary investigator of a phase I clinical trial that started in 2015 and involves genetically engineered T cells and pleural mesothelioma patients. 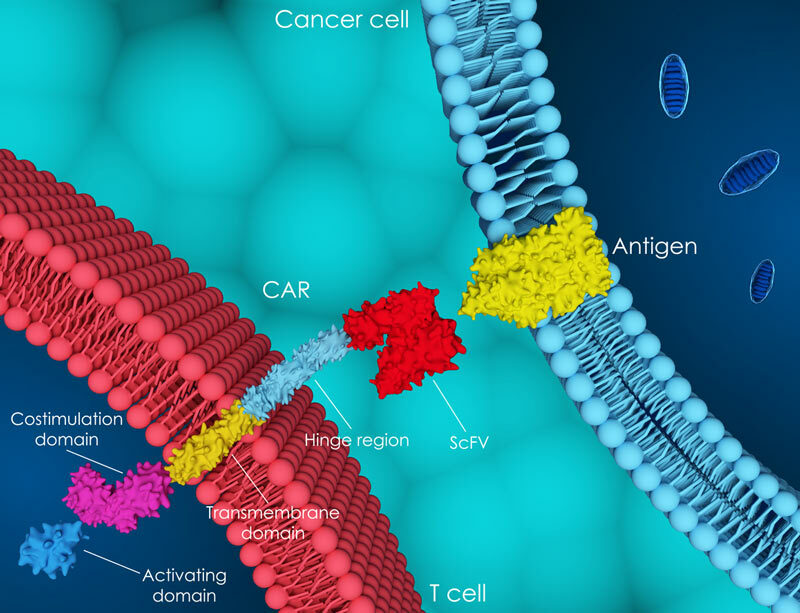 CAR T-cell therapy also is known as chimeric antigen receptor T-cell therapy. Adusumilli presented a clinical evaluation of his trial March 31 at the American Association for Cancer Research meetings in Atlanta. He is the co-director of the mesothelioma program, deputy chief of thoracic service and head of solid tumors cell therapy at Memorial Sloan Kettering in New York City. There were 21 patients in the study receiving different combinations of treatment with CAR T-cell therapy. Some also received a drug that can block interaction of PD-1, another cell-surface protein that prevents a patient’s immune system from attacking the cancer. Most of the patients also received cyclophosphamide, a preconditioning chemotherapy. The most effective combination in the study was using all three, where eight of the 11 patients saw significant tumor shrinkage. Two of the patients experienced a complete metabolic response. Overall, 13 of the 21 patients experienced a significant reduction in tumor burden. One patient, following the CAR T-cell treatment and subsequent tumor shrinkage, underwent curative-intent surgery. The anti-PD-1 drug is used to boost the endurance level of the CAR T-cell therapy, which otherwise is severely limited by the extensive tumor burden often found in mesothelioma patients. The phase I trial also showed little sign of serious toxicities related to the CAR T-cell therapy, which was the original intent of the study. Adusumilli, who is regarded as an international leader in the field, presented similar, earlier-stage findings in 2018 at the American Society of Gene and Cell Therapy meeting in Chicago. Until recently, CAR T-cell therapy had been proven effective only when treating blood cancers such as leukemia and lymphoma. Advanced-stage solid tumors, before now, had been considered too challenging for this type of cancer cell therapy. Plans already are underway at Memorial Sloan Kettering for advancing the therapy with another study revision in 2019 and beginning a new clinical trial in 2020. The National Cancer Institute recently awarded Abramson Cancer Center at the University of Pennsylvania a $10.7 million grant in 2018 to further explore CAR T-cell therapy with mesothelioma and lung cancer. At the conference in Atlanta last month, Baylor College of Medicine Dr. Shoba Navai presented alongside Adusumilli, detailing the success he saw with CAR T-cell therapy targeting a different cell-surface protein on different solid tumors. Six of the 11 patients in his trial achieved objective responses or stable disease. “Our trial shows early evidence that efficacy is possible,” Navai wrote in his report. Adusumilli cautioned patients against overly optimistic expectations, but he was well received by those looking for hope with this tough-to-treat cancer. He still doesn’t believe mesothelioma can be contained by any single treatment, but emphasized the search to find the right combination for each patient. Fitzgerald, K. (2019, April 5). Study Shows CAR T-Cell Success in Solid Tumors.